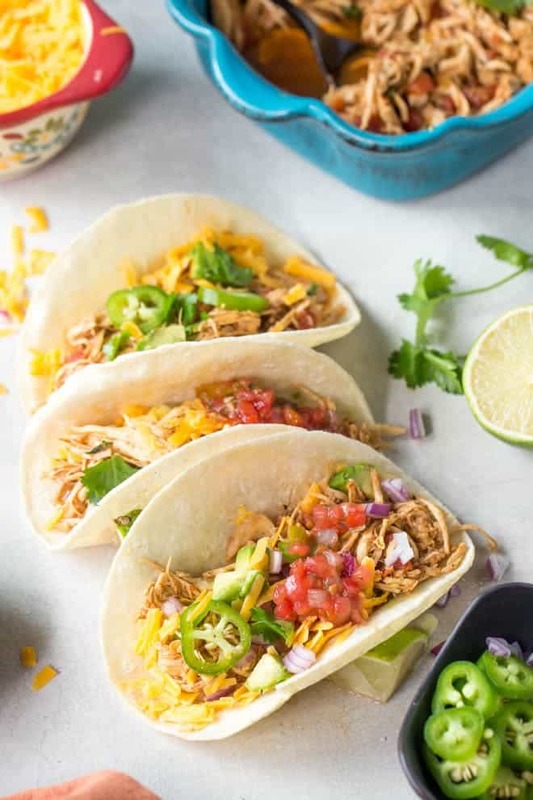 Slow cooker chicken tacos are made with only a few ingredients and slow cook in the crockpot to make dinner easy! 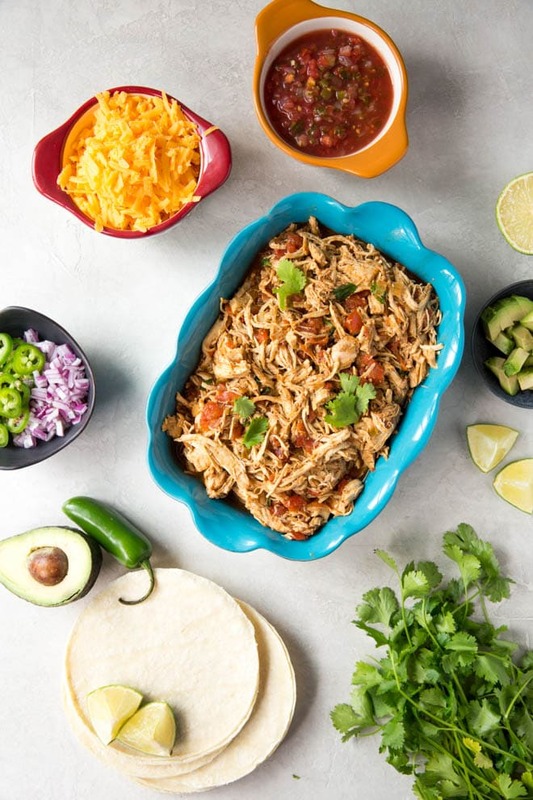 Add your favorite taco toppings to the shredded chicken and create a chicken taco recipe that the entire family will love. Homemade tacos make an appearance on my dinner menu at least once per week! The taco filling cooks in the slow cooker all day so it’s ready at dinnertime. Combine a few ingredients that you probably already have in your pantry for this chicken taco recipe. Add your favorite toppings like avocado, diced red onion, cilantro and salsa to customize the tacos to fit your taste. 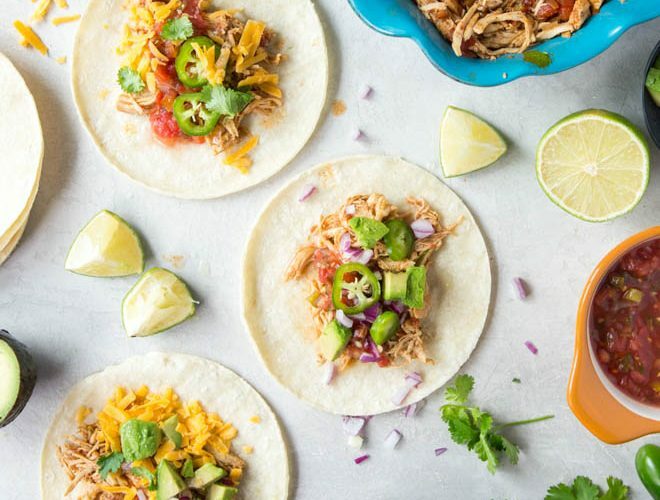 Slow cooker shredded chicken tacos are the perfect addition to your dinner menu to create an easy weeknight meal. 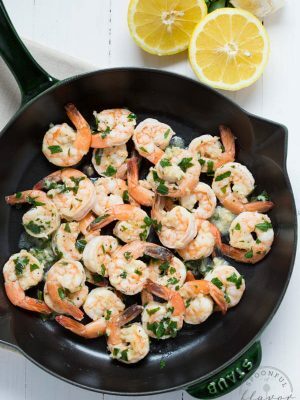 They are packed with flavor and so easy! 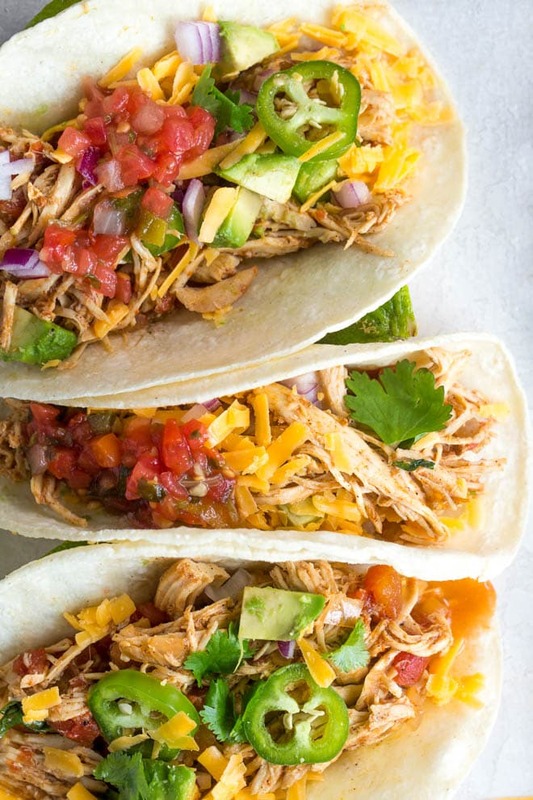 To make slow cooker chicken tacos, combine two pounds of boneless, skinless chicken breasts with taco seasoning and salsa in your crockpot or slow cooker. You can use homemade taco seasoning or store-bought. Instead of salsa, you can also use one can of diced tomatoes with green chiles and red onion. Add lime juice and cook on high for 2 to 3 hours or low for 5 to 6 hours. Remove the lid, shred the chicken with two forks and serve with your favorite taco toppings over corn or flour tortillas. We use homemade taco seasoning but you can also use store-bought for these tacos. To make homemade taco seasoning, combine 1 1/2 tablespoons chili powder, 1/2 teaspoons cumin, 3/4 teaspoon paprika, 1/2 teaspoon coriander, 1/2 teaspoon oregano, 1/2 teaspoon sea salt, 1/2 teaspoon black pepper, 1/4 teaspoon garlic powder, 1/4 teaspoon onion powder and 1/4 teaspoon crushed red pepper. Click here for a printable version of our homemade taco seasoning. Layering tacos with our favorite toppings is the best part about making tacos. Below are a few of our favorite taco toppings, but feel free to use your own favorite taco toppings. Save time at dinnertime by prepping all of the topping fillings in advance. The chicken filling takes less than 10 minutes of prep work and an additional 10 minutes to prep the filling ingredients. You can prep the filling up to a day or two prior to serving. 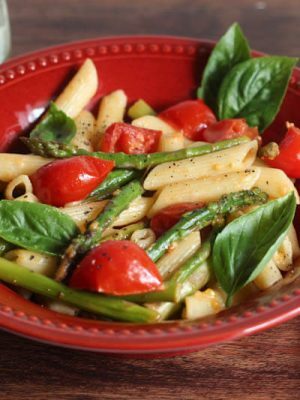 You can make the entire meal in advance and reheat throughout the week. These tacos work great for meal prep and are enjoyed for lunch or dinner. Make taco or burrito bowls for lunch with the chicken and toppings. Add rice for serving with burrito bowls. We also love these Buffalo Chicken Taco Bowls served over butter lettuce and with homemade pineapple mango salsa. 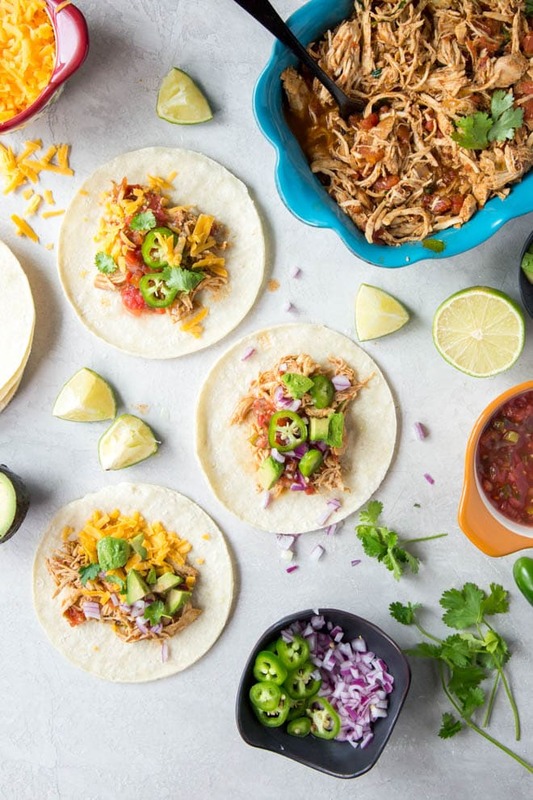 Create a taco bar for guests by making a large batch of shredded chicken taco filling. Add each of the above ingredients to serving dishes. Offer hard and soft shell corn and flour tortillas or taco shells. Allow guests to choose the toppings to layer over the taco shells. Serve with additional hot sauce and enjoy! A taco bar is a great option for birthday parties, dinner parties and game day celebrations. If you are looking for an all-veggie taco then you will love these Butternut Squash, Black Bean and Kale Tacos. They are packed with flavor and you can save time with meal prep. We also love our Shrimp Tacos with Mango Avocado Salsa. Try these Slow Cooker Carnitas Tacos made with beer and fresh citrus for a fresh crisp taco flavor. Who said you can’t eat tacos for breakfast? If you’re looking to start your day with tacos, try these Egg, Green Chile and Cheese Breakfast Tacos. They are one of our all-time favorite tacos! 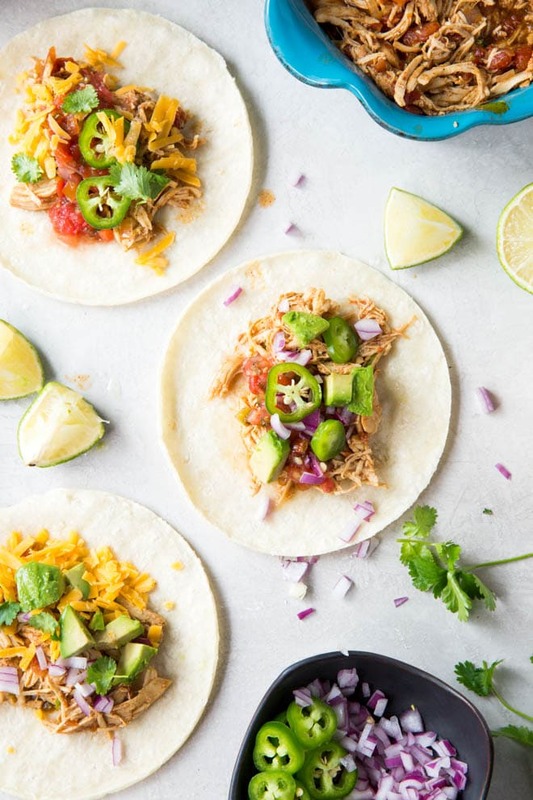 If you are looking for an easy clean eating recipe or a simple crockpot shredded chicken taco recipe, then you must try these tacos. After you try them once, they will be a weekly addition to your weeknight dinner menu. They are quick, easy, packed with flavor and great for the entire family. Try them and then leave a review below to let us know what you think. 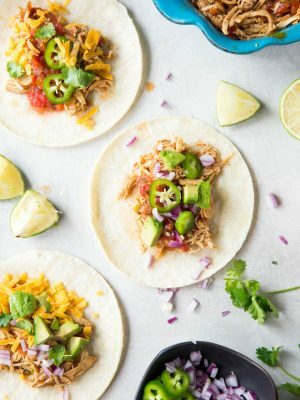 Slow Cooker Chicken Tacos are made in the crockpot with a few ingredients. Top the chicken with your favorite taco toppings! Spray the bowl of a slow cooker with non-stick cooking spray. Place chicken breasts in an even layer in the bottom of the slow cooker. Sprinkle taco seasoning evenly over the chicken then top with diced tomatoes or salsa. Squeeze lime juice on top of everything. Cover and cook on high for 4 hours or low for 6 to 7 hours. Remove the lid and shred the chicken with two forks. Serve with tortillas and your favorite taco toppings. **If using diced tomatoes instead of salsa, you can add 3/4 cup of chopped red onion to the slow cooker for additional flavor. 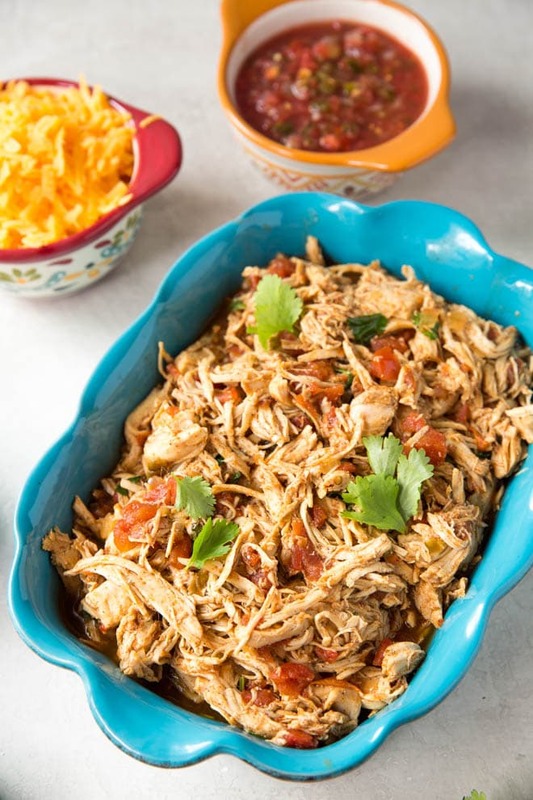 The shredded chicken cooks in a slow cooker. We love this inexpensive 6 quart Crock-Pot. Use your favorite salsa and taco seasoning. Arrange all of the toppings in colorful serving dishes. Reviewing this recipe makes me want to make it again. Probably my favorite slow cooker recipe. I made it using the home made taco seasoning and it turned out great! I'm happy to hear you loved this recipe and used the homemade taco seasoning. This recipe is one of our favorites for dinner. Thanks for your feedback! If I double the recipe, should I adjust the cooking time? Hi, Hilary! You shouldn't really need to adjust the cook time as long as your slow cooker is big enough for a large batch. I would check them after 4 hours on high (6 hours on low) to see if they are cooked through. You may need to adjust the cook time slightly, but the slow cooker generally cooks things pretty evenly. Love this idea! I like that you cooked the chicken with salsa. Smart. I've made "pulled chicken" before, but never with a Mexican slant! It's so easy to cook it this way! And tastes amazing because of all of the fresh salsa ingredients. I'm adding black beans to mine! Smells so good my mouth is watering! Hi, Catherine! Black beans sound like a great addition. 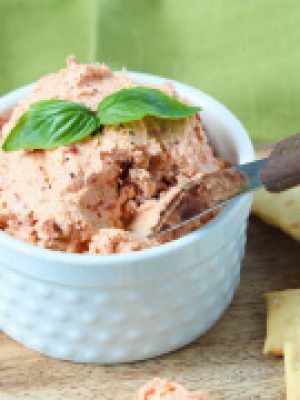 That's one of the best things about this recipe - it's so versatile and can be adapted to fit your tastes or whatever ingredients you have available in your kitchen. Enjoy! I am not at all a fan of Mexican food, however, these tacos are tastee. I used chicken tenders, so they were cooked in about 4 hours on low. I will be making these again. Thanks! Hi, Mary! I'm so glad to hear you loved them. The tacos are definitely great for a wide variety of tastes. Thanks so much for your comment!